Quick and efficient service without leaving your car. 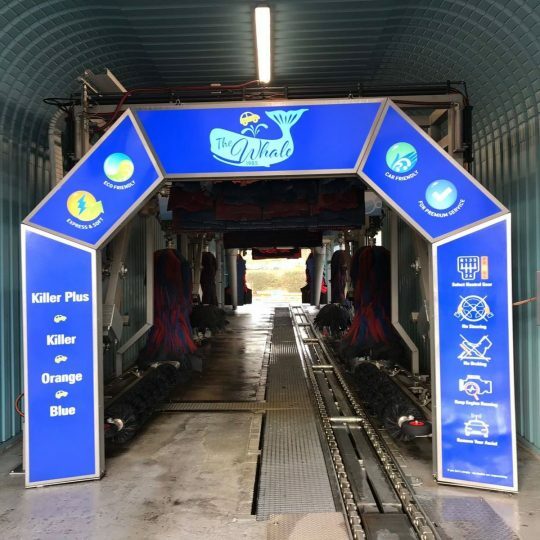 Car is prepared by the attendants before going into the tunnel for a wash, wax and dry process. The top quality waxes give the car a glossy finish for long-term. Why Choose a Machine Car Wash? We use the latest “Microvel Soft Cloth” textile which cleans, dries, buffs and polishes to the very highest standard. No swirl marks or scratches, just a quality finish. Best chemicals and waxes applied. We actually use two types of waxes on our top washes that give a better and longer lasting protection for your vehicle. We are one of the only few car washes to offer underbody wash and wax protection from rust and corrosion. Environmentally friendly, up to 75 % water is recycled to help reduce water wastage. “Microvel” brushes are used at Mercedes, Audi and VW Factories and Outlets Worldwide. Imagine how grit is transferred on to paintwork when washing a dirty car with a cloth or sponge. Even after intensive rinsing, a sponge is often full of acute, sharp edged grit granules. We avoid all of this by preparing your car with a traffic film remover and high pressure jet wash. Once you go through the machine the car is rinsed again by a high pressure arch before the soft textile brushes. Don’t forget our brushes are constantly spinning so grit doesn’t get a chance to stick. Remember, it used to be the case that vehicle manufacturers said always wash your vehicle by hand – never machine! If you look in most handbooks now you will see the vehicle manufacturers saying it is best to clean your car using “Soft cloth car wash”. We have conveniently located the Whale Car Wash near Brighton. With our speed and style of service, you can have your car washed in under 5 minutes, without leaving your car! You should clean your vehicle a minimum of every three weeks, to help you with this we now have a NEW Loyalty scheme in place. You can now get a free top wash after collecting 10 wash stickers to keep your vehicle looking shiny, protected and new with no excuses! WHICH CAR WASH IS RIGHT FOR YOU? Perfect gift for Car Enthusiasts! Perfect for leaving the right impression with your customers! The Whale Car Wash is equipped for the 21st century. We believe allowing our customers choice of payment methods is essential to great customer service.